This modern and sustainable 10,000 sf branch library features a dramatic entry vestibule, a large main reading area, separate reading rooms for youth and children, and a community meeting room. A variety of sustainable design strategies are employed throughout the project including a 25.2 kW photovoltaic system that is expected to generate approximately 32,000 kilowatt hours annually (power sufficient for about three standard sized homes), large roof overhangs and a daylight responsive lighting control system, and a rainwater harvesting system. 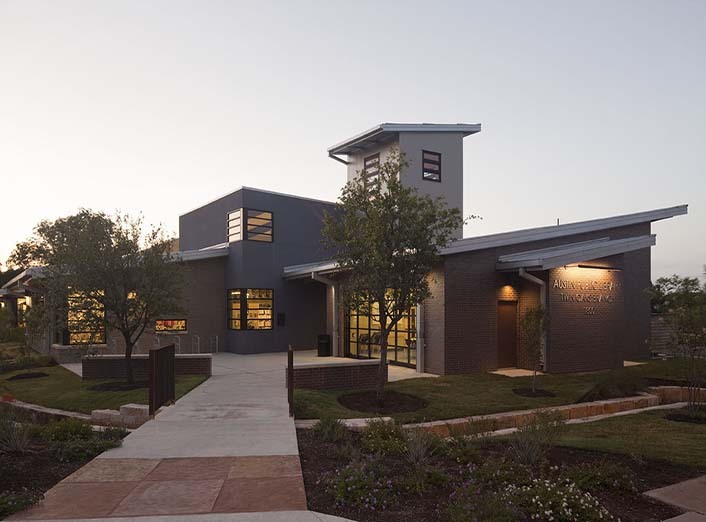 Additionally, bricks salvaged from the old South Austin Post Office building were used in the new building and the use of reclaimed Douglas Fir saved the equivalent of about 30 large trees. The building itself occupies less than half of what used to be the fully concrete covered site of the old post office. In its place, in addition to the new building, is a neighborhood pocket park, amphitheater, inviting landscaping, and rows of shade trees.